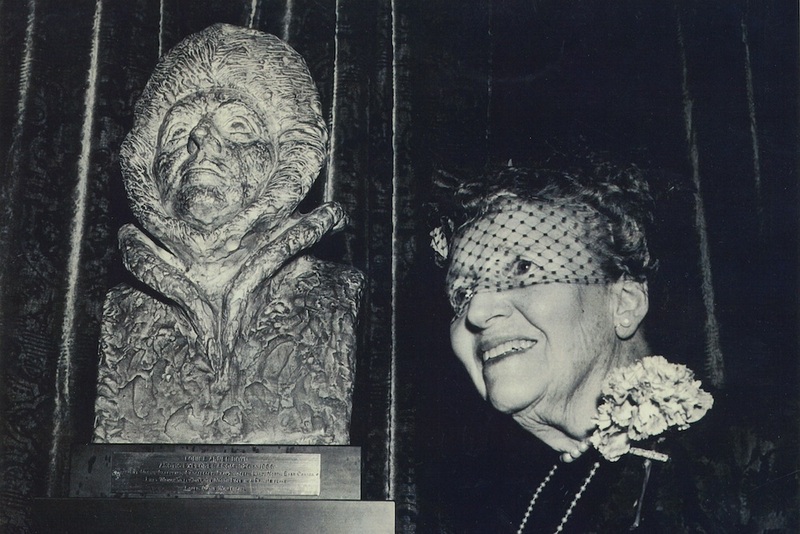 A sculpture of Louise Arner Boyd alongside the subject herself. This bust is part of the Marin History Museum collection in Novata, California. Courtesy of Joanna Kafarowski. Louise Arner Boyd was the world’s leading female Arctic explorer and geographer. By that time, she had organized, financed, and led six maritime expeditions to East Greenland, Franz Josef Land, Jan Mayen Land, and Spitsbergen. She had been showered with honors by five countries, and her scientific accomplishments and daring exploits had earned her newspaper headlines and global renown. A month earlier, many journalists had covered the departure of the 1941 Louise A. Boyd Expedition to Greenland from Washington D.C. But after the Morrissey weighed anchor, more than a few local residents wondered what this outspoken, unusual woman was doing in the company of high-ranking officers engaged in war matters. Exploration of the Arctic seascape—with its vast expanses of bobbing ice, the rhythmic sway of the wooden ship as it traversed the surging waves, the soothing solitude of the north—resonated deeply with Boyd and defined who she was and what she did. But her life took unexpected turns. Her brothers died young; her parents did not survive into old age. By the time she was in her early thirties, she had lost her entire family and inherited a fortune. Unmarried and without children, she followed a dream to travel north. Her first tourist cruise to the Arctic Ocean was so moving that she returned a few years later. This second voyage was also only a pleasure trip, but she chose Franz Josef Land as her destination—then as now, one of the most remote and unforgiving locations on Earth. Following her return to California, Boyd knew that her future was linked to the north. But it took a stroke of destiny to transform her into an explorer. Boyd planned her first full expedition and arrived during the summer of 1928 in the far northern Norwegian city of Tromsø, prepared to set sail. She was shocked by the news that the iconic explorer Roald Amundsen—conqueror of the South Pole and the first person to successfully traverse the Northwest Passage—had vanished while on a flight to rescue another explorer. A desperate mission involving ships and airplanes from six European countries was launched to locate Amundsen and his French crew. Boyd lost no time in putting the ship she had hired, as well as the provisions and services of its crew, at the disposal of the government in its rescue efforts. But there was a catch—Boyd demanded to go along. The Norwegian government eagerly accepted her offer, and she ended up an integral part of the Amundsen rescue expedition. Only the most experienced and high-ranking explorers, aviators, and generals had been chosen for this dangerous undertaking, and no allowances were made for a woman. Despite her lack of expertise and the skepticism of male expedition participants, Boyd assumed her responsibilities with vigor. 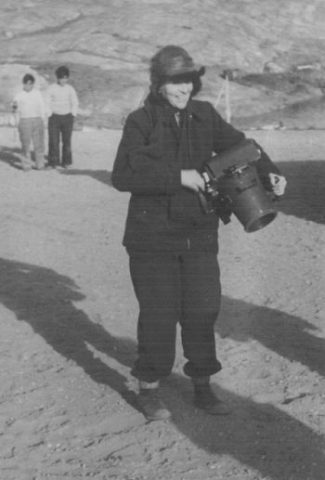 Louise Arner Boyd holding a piece of equipment on an expedition. Courtesy of Joanna Kafarowski. Tragically, Amundsen was never found, but by the end of that fateful summer, Boyd had won awards from the Norwegian and French governments for her courage and stamina. And she had discovered her purpose in life as an Arctic explorer. From this point forward, she began living a double life. While at home in the United States, she was a gracious hostess, a generous benefactor and a beloved member of California high society. While sailing on the high seas, she assumed a different, heroic identity. How did one become an explorer? She had no formal education to draw on. She had left school in her teens, had limited outdoor expertise, and no family members remained to advise her. Instead, she implemented her charm and networking skills to identify individuals who could help her. She developed an unerring ability to choose exactly the right scientist for the job. Her expedition participants included geologist and famed mountaineer Noel Odell, who was the only survivor of the tragic British Mount Everest Expedition of 1924. She was also a remarkably fast learner who sought out experts in her fields of interest—including photographer Ansel Adams and California Academy of Sciences botanist Alice Eastwood—to teach her what she needed to know. During the 1930s and ’40s, Boyd’s skills and abilities as an explorer grew. Unlike her male colleagues, she had no interest in conquering territories or being the “first.” Rather, as a self-taught geographer who was awarded the Cullum Geographical Medal in 1938 (only the second woman to earn it), Boyd focused on contributing to science. She left extensive photographic documentation of Greenland currently used by glaciologists to track climate change in Greenlandic glaciers. She pioneered the use of cutting-edge technology, including the first deep-water recording echo-sounder and photogrammetrical equipment to conduct exploratory surveys in inaccessible places. She discovered a glacier in Greenland, a new underwater bank in the Norwegian Sea, and many new botanical species. More than 70 years later, data generated during her expeditions is still cited by contemporary scientists in the fields of geology, geomorphology, oceanography, and botany. For all this good work, she was not universally respected by her expedition participants. Despite her seemingly gregarious nature, Boyd battled shyness and struggled at times to assert herself. Initially, most academics were happy enough with her credentials and her generous offer to join the team, but once the expedition was underway, some of them ridiculed her behind her back and undermined her position as leader. University of Chicago geologist Harlen Bretz and Duke University plant ecologist H.J. Oosting wrote scathingly about her. By the time the war was over, Louise Arner Boyd was nearly sixty years old; the 1941 trip was her last true expedition. In 1955, she would realize a dream by becoming one of the first women to be flown over the North Pole. And her polar work continued—through her active participation as an American Geographical Society Councilor, and a member of the Society of Woman Geographers and the American Polar Society—until her death in 1972. Today the name Louise Arner Boyd is only a dim memory. But it is one worth reviving. Joanna Kafarowski is an independent scholar and author of The Polar Adventures of a Rich American Dame: A Life of Louise Arner Boyd. She is currently working on the first biography of Antarctic pioneer Jackie Ronne.